The fashion has been constantly changing and new trends are being adapted worldwide and Muslim women stand no exception to this fact. A plain black hijab may appear to be dull but there are numerous ways a hijab can be stylized and beautified as per the taste of the women who wear them. Adding hijab accessories is the latest fashion trend and is being followed by female Muslims worldwide. 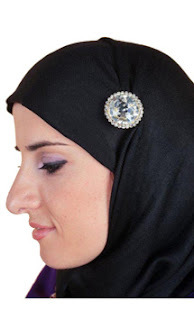 A hijab can be easily stylized with brooches that give it a distinguishing and an interesting look. These hijab brooches come in different varieties and one can choose from the plethora of designs. These brooches add elegance to your plain outfit. It is advisable that the color of hijab should complement the dress you’re wearing. Usually matching colors are preferred by most women. A hijab should be stylized simply because too many colorful pins or brooches may take away the simplicity. Hijab headbands have gained huge popularity and are available in various prints. These headbands make you look traditional and stylish at the same time. Printed hijabs are a great option to prettify your outfit but bows and colorful headbands should be avoided as they often look unneeded with such hijabs. Brightly colored pins or heavy ornamental headbands should also be avoided with tie dye hijabs. Embroidered hijabs are also being preferred and are in vogue. These hijabs usually come in light colors and can be easily carried with ornamental head bands for an aesthetic look. Hijab headbands with beautiful embroidery are being popularly used to decorate plain hijabs and make them look elegant. A hijab can be decorated in many ways with numerous accessories which are available in market. One can add interesting headpieces or bonnets to a plain hijab for astonishing results. But, the accessories should be carefully chosen and should be in accordance with the hijab as well as the dress. Subtlety and simplicity along with elegance should be followed while exaggerated headbands and other such accessories should be avoided.